In the study, published in the current issue of the Massachusetts Institute of Technology's arts and sciences journal Leonardo, UBC researcher Steve DiPaola argues that Rembrandt may have pioneered a technique that guides the viewer's gaze around a portrait, creating a special narrative and "calmer" viewing experience. Working with a team from the Vision Lab in UBC's Dept. of Psychology, DiPaola then tracked the viewers' eye movements while they examined the original photographs and the Rembrandt-like portraits. 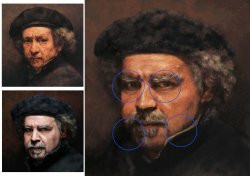 "When viewing the Rembrandt-like portraits, viewers fixated on the detailed eye faster and stayed there for longer periods of time, resulting in calmer eye movements," says DiPaola, who is also an associate professor at Simon Fraser University and adjunct faculty at UBC's Media and Graphics Interdisciplinary Centre. "The transition from sharp to blurry edges, known as 'lost and found edges,' also directed the viewers’ eyes around the portrait in a sort of narrative." The study is the first to scientifically verify the impact of these "eye guiding" techniques on viewers and to attribute its origin to Rembrandt. The viewers also preferred portraits with this "eye guiding narrative" to the original photographs with uniform details across the tableau. "Through these techniques, Rembrandt is essentially playing tour guide to his viewers hundreds of years after his death, creating a unique narrative by guiding the viewers' eye," says DiPaola. "This may explain why people appreciate portraiture as an art form. "Whether he observed how his own eyes behaved while viewing a painting or if he did it by intuition, Rembrandt incorporated an understanding of how the human eye works that has since been proven accurate," says DiPaola.